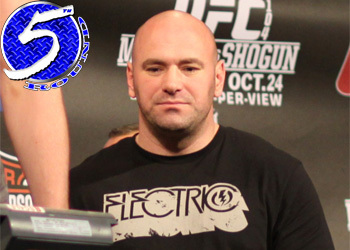 UFC president Dana White has been in hyper-drive in regards to the promotion front. He’s done more than his part to ensure everyone under the sun knows the biggest scrap in history will be going down tonight when heavyweight king Brock Lesnar looks to unify the title against interim champ Shane Carwin. UFC 116 will be jumping off inside the MGM Grand Garden Arena in Las Vegas, Nevada tonight, marking the first time Lesnar has set foot inside an Octagon since giving Frank Mir the business at UFC 100 back in July 2009. Coincidentally, Carwin posted a vicious knockout of the former champion in his last outing as well. Although, the engineer only needed one round to dispose of Mir, while he was able to extend Lesnar into the second stanza. Although the Gambling Gods have been teetering, as of publication the former WWE superstar is a slight favorite (-140) to give Carwin his first professional blemish. Despite talking UFC heavyweights all week, White couldn’t avoid questions regarding Fedor Emelianenko. The world’s former/current top dog was upset last Saturday by 4-to-1 underdog Fabricio Werdum at “Strikeforce: Fedor vs. Werdum” and the brash promoter couldn’t help but kick the downed Russian.